Flight Attendant Outfit for Genesis 2 Male for use in Daz Studio 4.6. MAT preset to hide the sleeves of the shirt under the jacket. I have also included several Textures. 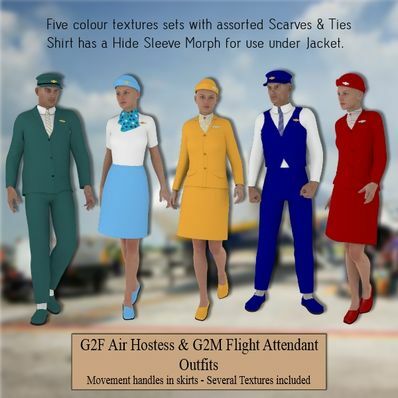 Air Hostess Outfit for Genesis 2 Female for use in Daz Studio 4.6. Very neat :) I'm glad you're continuing to do G2 stuff! WOW... such great outfits... THANK YOU... Happy New Year hugzzzz!!! Support for Genesis 2 is always appreciated. I'm glad to see that you are continuing to do so. But more kids' clothes would be nice too, if ever you find the time. Thank you for continuing to support Genesis 2! Thanks Wendy and Happy New Year to you. Many thanks. I tried them also with some Iray shaders and they looked good! Thank you very much for this wonderful set!